If you're looking for digital or downloadable fill-in-able AIA contracts, documents, and forms ... I have some good news! 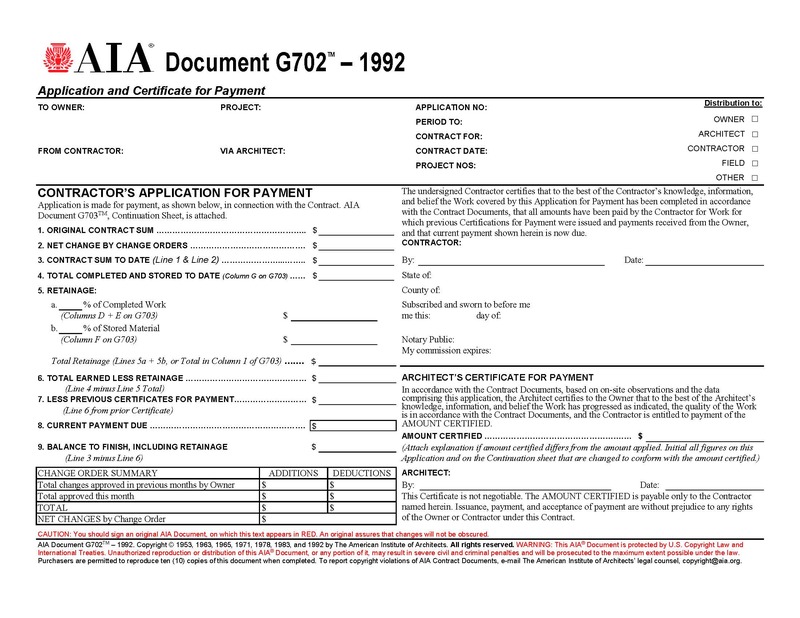 Some AIA forms are available as digital documents at PDFfiller. Plus turn your own forms into digital documents. Visit PDFFiller for more info. I priced the AIA's 'packages' recently and found that they can run as high as $2000 and more! The packages are basically licenses for a certain amount of uses of the form - once you hit that number you have to pay for more uses. As an option to the 'packages' they also offer a '﻿Documents on Demand﻿' service that allows you to purchase individual uses of a digital copy without having to purchase an entire package. I found that some of their forms are $40 and higher - for ONE use. If you are a "high-volume user" of AIA forms, please take a look at the software below. Software that fills in hard-copy AIA forms *and* includes AIA-Like forms that'll print in their entirety, for when you don't *have* to use an actual AIA form. There are several companies that have created software programs that'll fill in your hard copy AIA forms for you. You use the software to 'fill in' the form on your computer and then put a hard-copy AIA form in your printer and hit print. Provided it's all lined up well it's almost as good as having digital versions. It prints the information onto the form and you're good to go. They come with 'AIA-Like' documents - they aren't the actual thing but close enough to the actual thing that many users of AIA forms are finding that the 'Like' forms are being accepted in place of the actual. ... and Mark, the owner, has provided an exclusive offer for my readers - up to 40% off the various modules. Please use the links here at my site when you're ready to visit his site or the offer won't be available. Should you decide to purchase the program please make sure the code TCG is in the discount box before you check out (if it's not then you can enter it in the box); the discount is available only before the purchase, not after. Doing your AIA paperwork with the Quantum software program is like having the original electronic forms from the AIA site - but without the outrageous expense. The AIA® requires users of its forms to purchase a new copy every single time they need one; unfortunately they charge up the ying-yang for it. Find a typo on your document? Did something change on the project requiring a change to a document? Need to re-award a trade because the Sub you already wrote up the contract for, for whatever reason can't do the job? Just a simple change to a document means you're required to use (and pay for) a whole new blank AIA form to create and print a revision. I don't know if using white-out and writing in the proper information is allowable to the AIA but most surely it's not good in the eyes of your customers. If you need to make changes it's as simple as editing what you entered, saving it, and printing it again (the entire form will once again print and it'll have your changes). You can do that as often as you need to because the included AIA-Like forms are unlimited usage - unlike those beyond-outrageously expensive, genuine AIA forms. If you absolutely have to use actual, original AIA documents you still can, and should, use this software program. If you need to make changes it's as simple as editing what you entered and saving it (but you'll have to use a new original AIA document to print the one with changes because of the AIA requirements for using their forms). This software program is a minimal investment with the capabilities it has and the time it'll save you. Now you can do things you *want* to do rather than having to drudge through endless paperwork that you *have* to do. Oddly enough when you look at it, the AIA forms aren't an investment in any way, they're an ongoing cost. Unfortunately the AIA forms will continue to cost you every single time you need to use one but that's the AIA's doing. When a customer wants AIA forms see if you can't instead get them to go for the documents within this software program that very closely resemble the AIA forms. Let them know that because you'll have to pay for every usage of every document, if they insist on actual AIA documents, the price of the project will increase due to the boost in overhead from the expense of the AIA forms. Please Click Here to visit Quantum Software Solutions … and don't forget your secret discount code TCG! How Often Do You Find Yourself In A Win-Win-Win Situation? And unlike the actual AIA forms, the AIA-like forms are unlimited usage; they don't cost you every time you use them. Win #3: You save money, your client saves money (if you choose to pass on some of the savings), :o) and you'll present an even more professional image to your potential client - enhancing your chances of winning the project. So if you find that you don't have to have actual AIA forms and can use AIA-like forms instead, or if you'd like to fill in the actual AIA forms with your computer, then check out this program that does exactly that. Use the one-time use AIA forms when you absolutely have to use AIA and then use the unlimited usage AIA-like forms (included) whenever you can (they're unlimited usage) and avoid those outrageously expensive AIA forms. For some overkill… ;o) Here's that link one more time to visit Quantum Software Solutions to see what they have for you … and don't forget your secret discount code TCG!